Frances relied on sister Margaret at home and in the field. 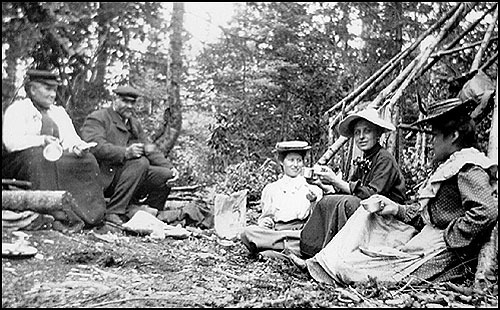 TO CONTEMPORARY AMERICANS, the 1905 Densmore expedition to Grand Portage, Minnesota may not seem particularly adventurous. At the time, though, it was unusual for two unmarried white ladies in their 30's to trek off to a remote Indian village near the Canadian border, guided by an Ojibwe man they had never met before. The trip was financed with a $50 check from the wife a wealthy Pittsburgh businessman who also sponsored Alice Fletcher's work. There was no road along the craggy North Shore of Lake Superior. On August 8, the Densmore sisters took a boat from Duluth to Grand Marais, hitched a ride on a logging tug and then on a sailboat to reach the Ojibwe village at Grand Portage. They hired an Ojibwe man named Caribou to be their guide. He took them to a medicine man's camp in the woods. The trail . . . was longer than I expected. Deeper and deeper we went in the woods, and I preferred to see the big Indian walking in front, rather than to hear him crunching along behind me. It was a pretty path. The wild raspberries were ripe and the big gorgeous butterflies of the north-country fluttered around us, but my thoughts were not entirely on the beauties of nature. Caribou would often look over his huge shoulder and say reassuringly, "Don' be 'fraid, little farther now, just little farther." The Densmore sisters met a medicine man named Minagunz (Little Spruce). 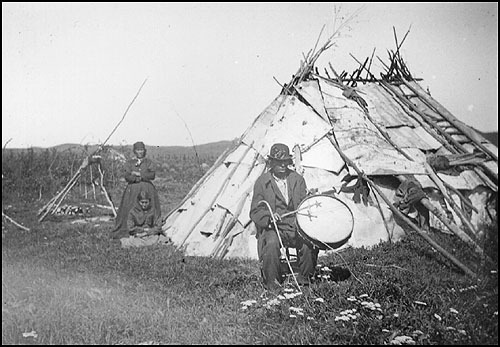 They watched him perform in a Mid'wiwin (Grand Medicine Society) ceremony. The next day, Frances went to Minagunz's house and asked him to repeat some of the dances so she could take notes.